Theme: This is my awesome "bento"
Weight is different, the purpose is different. Lunch is the same, but there's a lot of differences. Bento are eaten every day. 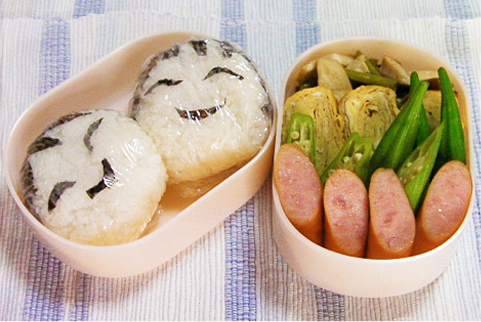 The person eating the bento is having fun, but the person making the bento is always thinking about many things. Thank you. It's every day, so the effort is important. I'll introduce the bento from my family. Now, I live with two people. Every morning, my wife wakes up at 6 and makes bento for the family. My daughter is in junior high school and has a school lunch, so my wife makes two bento. This day was right before summer vacation, so there was no school lunch, so my daughter also gets a lunch. Everyone has the same foods and cod roe rice, but the sizes are different. The black box is mine, green is my wife's, and pink is my daughter's. The sizes may be different, but everything in all three are delicious and because you can feel the love, I am very happy. 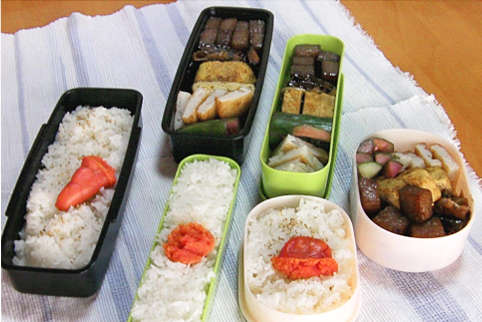 The lunch box in the middle is really narrow and long! Cheers to your wife for good work! My oldest daughter living in Tokyo by herself came back home. When she was going back to Tokyo, my wife made her this bento so she could eat it on the train. 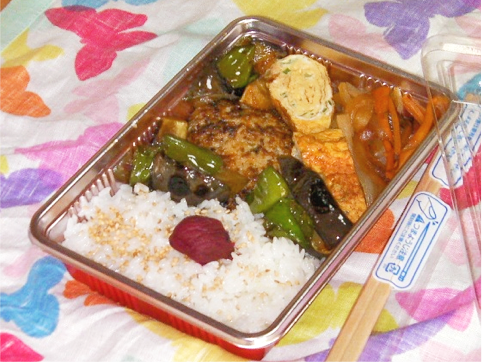 For the family's bento, they're always in their bento boxes, but, on this day, because she's going to eat it on the train, she'll need to throw out the box, so the food is in a plastic disposable bento box. Inside this plastic box was some different food, but, to use it again, we kept it aside. The insides are delicious, but from the outside too, you can see the love. It's a one-use bento box, but you reuse it, eh? That's very eco friendly! In my junior high school aged daughter, sometimes there are some rice balls inside. From when she was a small child, her mother would make character face rice balls using seaweed. My daughter would be very happy to have them. Even now, sometimes, my wife makes them. Since she became a junior high student, is she still happy? Even in my bento, these rice balls have been inside. It's a little embarrassing, but it was fun! When I come back from Tokyo on a business trip, I always buy a bento that I can eat on the Shinkansen bullet train. I'm always very excited for this station bento. I like to drink alcohol, so I always buy two cans of beer and a cup of Japanese rice wine and get on the train. The station bento is always this "All Japan Local Foods Bento". 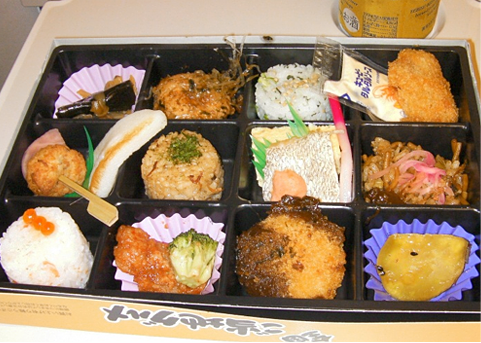 In the 12 spaces of this bento box, there are famous local foods from all over Japan. It really fits with the alcohol-liking me. While drinking a beer and eating the delicious foods from all over Japan one by one, I become very happy. This relieves the stress from my business trip! I've had that one too. Osaka's "takoyaki" fried octopus balls were in it. Next time I have a business trip, I'll try it! I'm jealous of those who can drink! !